Round two of the Vags championship was held on a dry but cool night. The forecast said 12oC with a 17mph wind blowing towards the North West (pressure was 1017 Mb with the relative humidity at 76). Another good turn out of riders assembled in Ponteland with eight club members taking the start out of the twenty riders. Out on the course the wind gave a tail wind on the section from Ogle towards the main road at Belsey. The leg down the main road was blustery but a good speed could still be kept up. 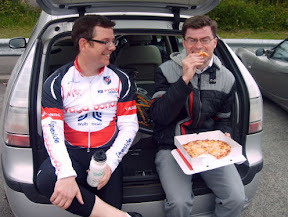 Paul Murphy had to dash round the course as he had pre booked a pizza for the finish ! The fastest time on the night was by Haydn Maughan 22:59 with the fastest Vagabond Craig Fenwick second with a 24.05.